Today’s fast-paced world and our full lives mean that sometimes we need to escape to a quiet and peaceful spot for awhile. That’s why spas and resorts are so popular. Getting away from it all allows us to take a break from day-to-day life and recharge. But often we don’t have the luxury of a full-fledged getaway due to schedules or finances. And sometimes all that’s needed is a few minutes of solitude to catch your breath and then go after things again. Wouldn’t it be nice if we all had those little corners of refuge close to hand? With the right landscape planning, you can. It’s likley that you can find just the right relaxing “resort” in your own back yard. 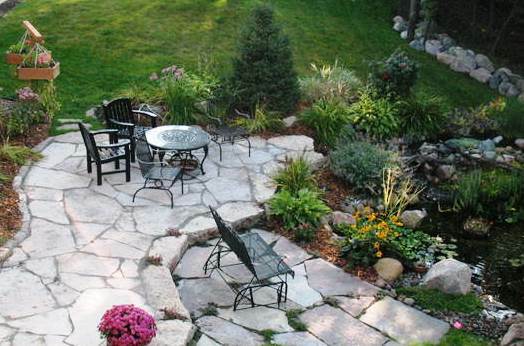 Nature can be incredibly soothing, and no matter what your yard is like – or how big your space is – there are things you can incorporate in your overall landscape design to provide that peaceful spot. Here are some ideas. Add a water feature. The gentle sound of water is extremely refreshing and relaxing at the same time. You can add a small bubbling or recirculating fountain, a koi or reflecting pond, or even a bird bath. 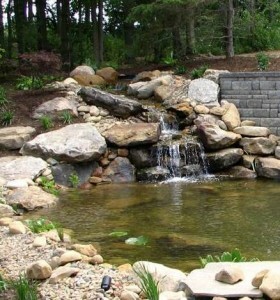 If the terrain in your yard allows, perhaps a small waterfall could even be added. Imagine sitting alongside this pond, dipping your toes and enjoying the sound of falling water! Find a shady nook. If you’ve already got a stand of shade trees, tuck a bench or a few comfortable chairs under them for the right spot to escape with your favorite book. No trees? An arbor or small pergola covered with vining plants can provide the shade as well as privacy. With the right touches, decks and porches can be great quiet spots, too. Shrubbery placed close to your deck or porch, some lattice work, and a few container plants can create a ‘nature nook’ if you’re short on yard space. Don’t forget the finishing touches. Low-voltage lighting makes your peaceful spots inviting at night as well. And if you add a fire pit or fireplace, you can extend your outdoor enjoyment into the cooler months as well. Next time you’re thinking about booking a resort vacation, consider investing that sum in creating a resort in your own back yard with a landscape design that gives you some serenity close to home.